J2 Solutions, Inc., a leading technology services firm, announced today that it has once again earned the distinction as one of Philadelphia’s fastest growing companies, ranking at #28. 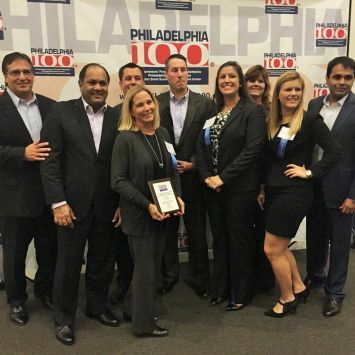 This is the second year in a row that J2 has been recognized in the top 30% of the prestigious Philadelphia 100 list. “With a three-year growth rate of 116%, we are proud to be recognized for a second year for our growth and industry leadership,” said Vijay Khatnani, co-founder and managing partner of J2 Solutions, Inc. “This recognition underscores our commitment to helping organizations develop and deploy the right technology solutions through IT services that provide measurable business value. Our sustained growth has been a J2 team effort, and we extend our thanks to our clients, without whom this achievement would not have been possible,” he added. A merit-based program, the Philadelphia 100 looks at percentage increase in sales from the prior three full years of business, honoring only the fastest growing, privately held companies in the Greater Philadelphia area. The list, established more than 25 years ago by The Philadelphia Business Journal, The Entrepreneurs’ Forum of Greater Philadelphia and the Wharton SBDC, is one of the most sought after awards in the region. J2’s rank was announced at the 27th Annual Philadelphia 100 Awards ceremony, held Oct. 15, 2015 at the Annenberg Center for the Performing Arts, Philadelphia, PA. The list will be highlighted in a supplement to the Philadelphia Business Journal in late October, which will offer a glimpse into the workings of the fast-paced, young companies featured on the list. Rankings can be found online at http://www.philadelphia100.com/history/past-winners/281-2015-philadelphia-100-awards. Founded in 2002 and headquartered in King of Prussia, PA, J2 Solutions is a technology consulting firm with a proven track record in managing large-scale technology projects, providing in-depth business analysis, and offering unparalleled IT staff optimization services. Our team of highly experienced project managers, business analysts and developers provide services in the following areas: Portfolio Management, Business Analysis, Application Development, Platform Implementation and Process Improvement. For more information, please visit: https://www.j2-solutions.com, or follow J2 on Twitter @J2_Solutions, Facebook or LinkedIn.